← What Happened to July? 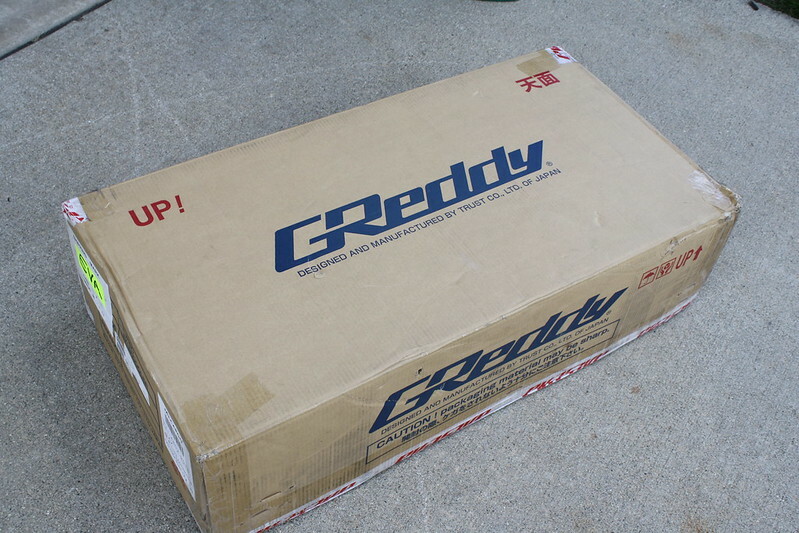 When we left off about a month ago, my GReddy T78 turbo and Type R wastegate had just arrived. 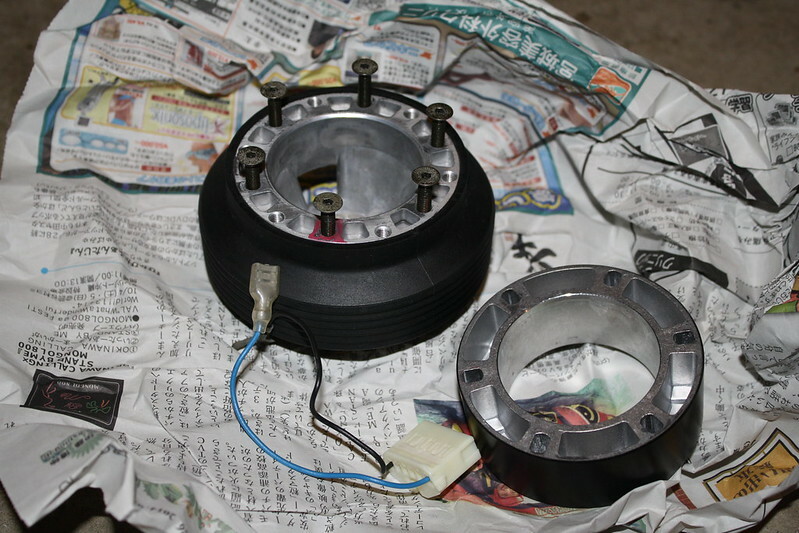 I had finished assembling the bulk of the engine, but was hitting resistance when I turned it over by hand. This was really frustrating, and after resetting the timing about six or seven times I finally caved in and removed the head from the engine block a second time. 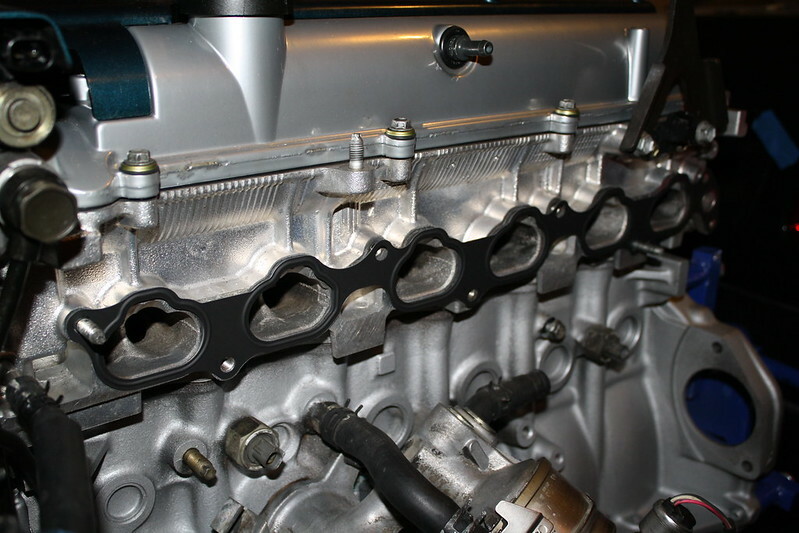 With some helpful advice from my friend Liam, I rigged up a makeshift engine head stand and installed the cams individually, then turned each one over slowly to see if I could pinpoint where things were binding up. 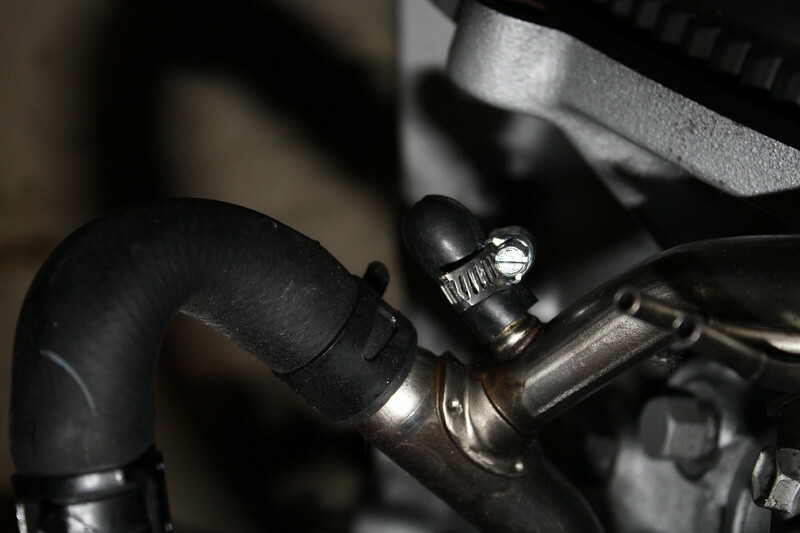 As it turned out, there was one particular valve on the exhaust side that was “stuck” and would not depress when the corresponding cam lobe was rotated over it. I was relieved to know that the valves had not been contacting the pistons like I had feared and that I had been setting the timing correctly all along. I took the head back to the machine shop and they took that valve assembly apart, reassembled it, and the binding was gone. That being said, a lot of August was lost to sorting out that debacle. It only took me a couple of hours to have everything put back together when the engine returned from the machine shop and I was back to where I had left off about two weeks prior- except this time, the assembly rotated properly. 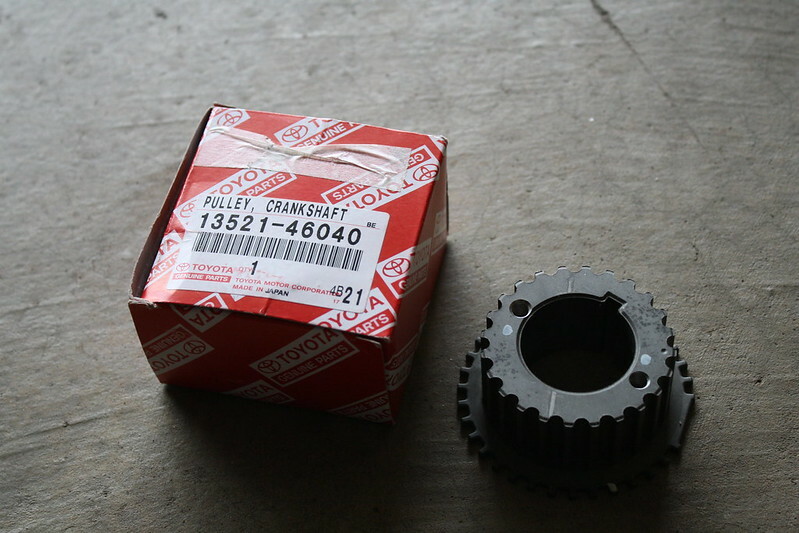 When I was removing the head, I realized that my timing gear had been damaged at some point during disassembly or reassembly after replacing the oil pump, so I promptly ordered a replacement and installed it. 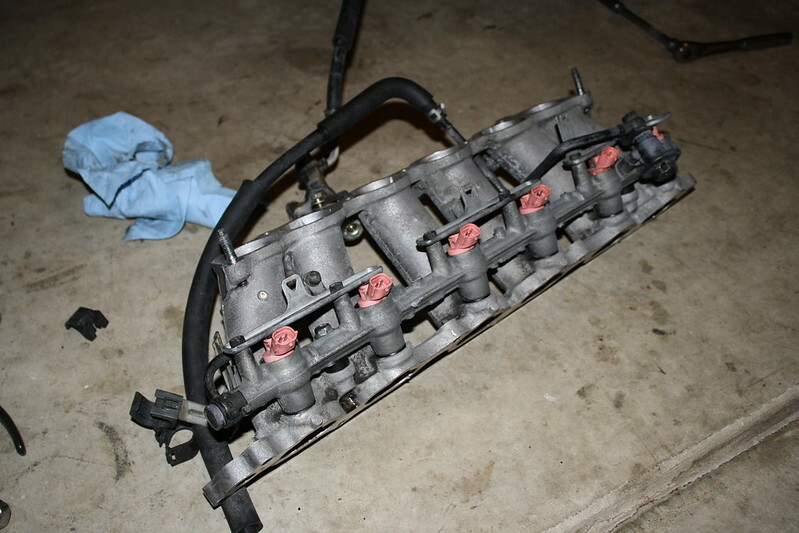 The next order of business was to install my SARD 840cc fuel injectors. 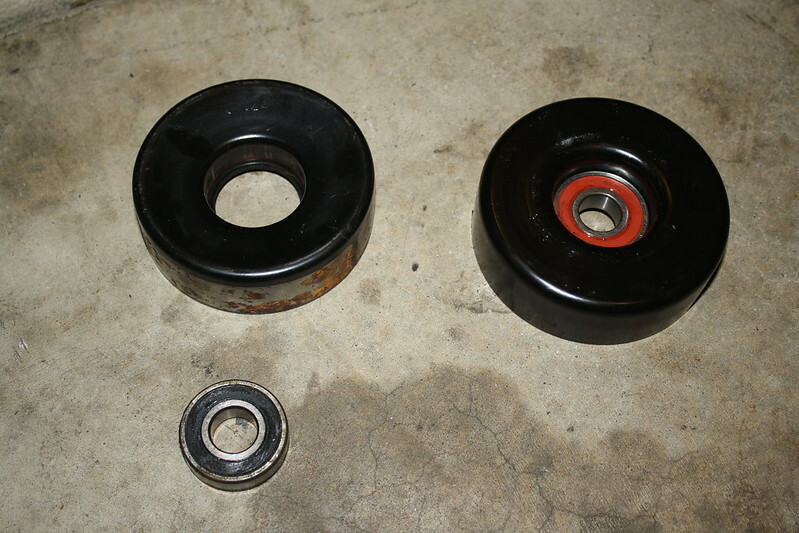 When removing the factory injectors, I found that all of the o-rings and isolators were brittle and cracked. 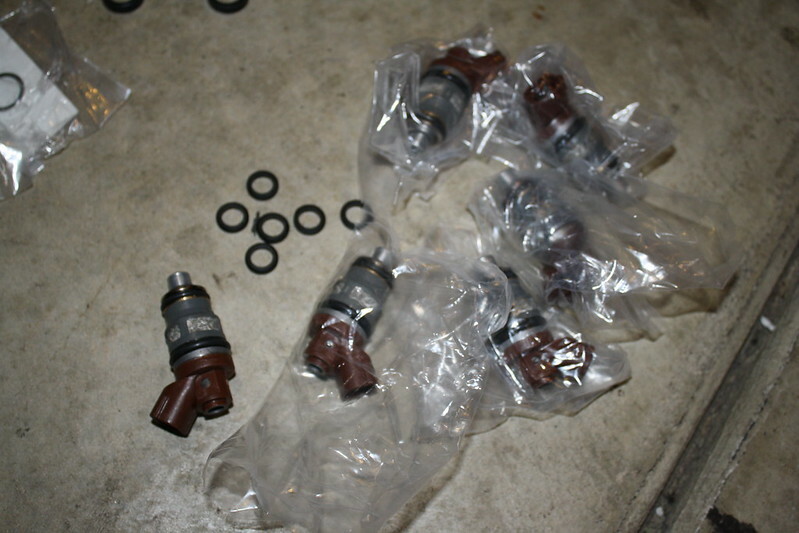 After another order from Toyota arrived, I was able to install the new injectors with the freshened up o-rings. 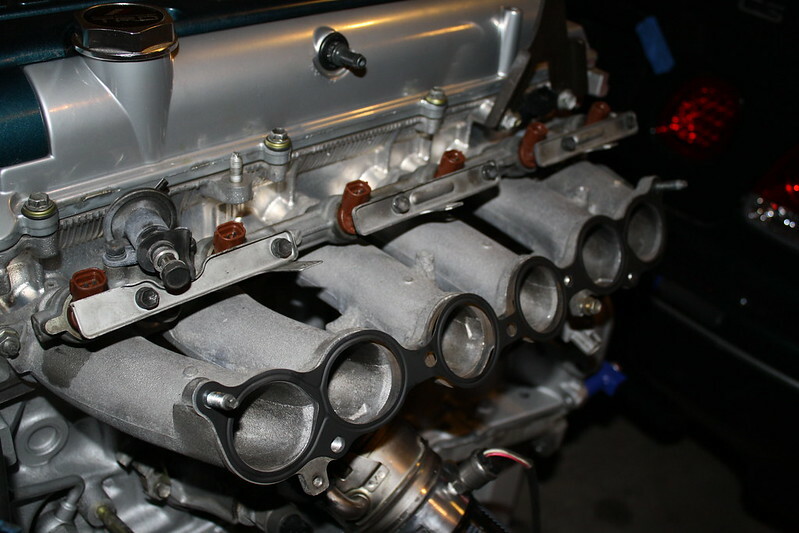 After tossing on a new intake manifold gasket, I bolted up the lower intake manifold and fuel injectors. My hope was to install the main engine harness next, as a few of the connectors are a bit tricky to get to with the upper intake manifold installed. When I attempted to do so, I found that one of my fuel injector clips was damaged and no longer locked in place. 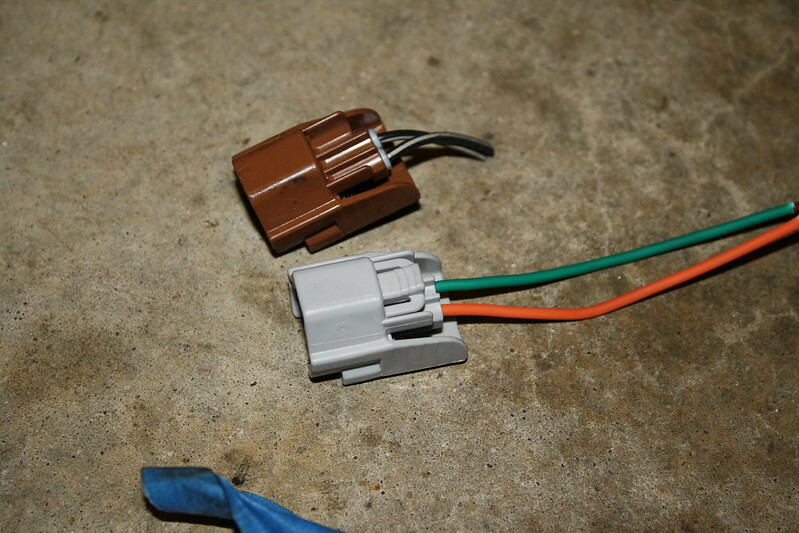 I ordered a replacement from Wiring Specialties and wired it up when it arrived a couple of days later, only to find that another injector clip was failing. 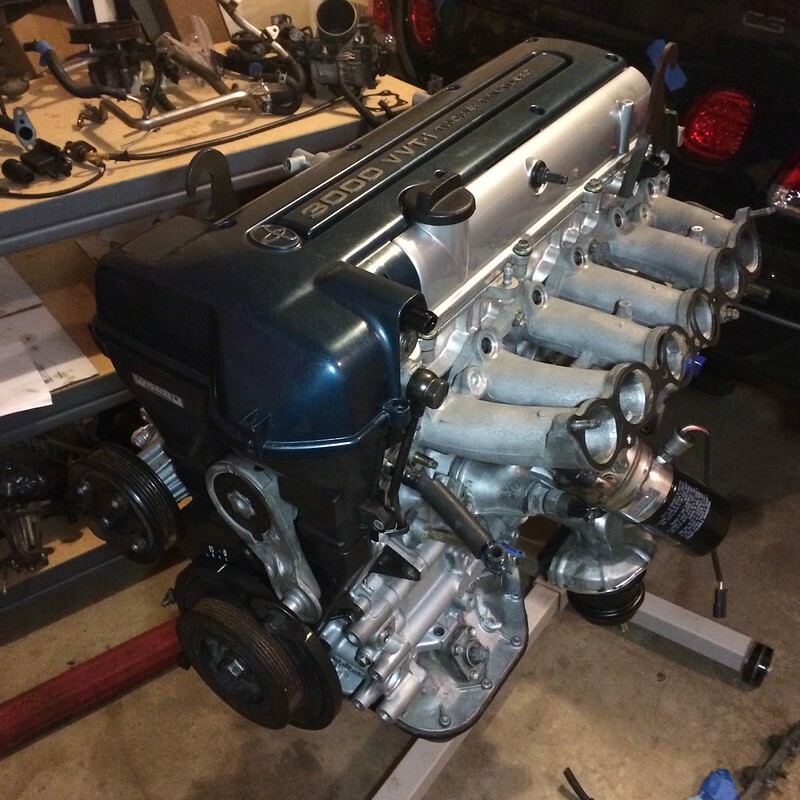 I decided to replace all six, so I’m currently waiting on those to arrive before I can install the harness, upper intake manifold, and throttle body. It’s always something with this build! 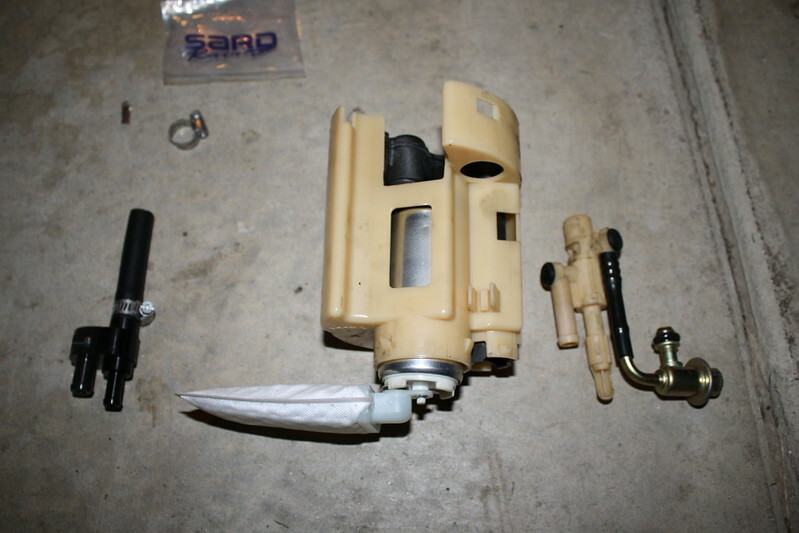 I removed the stock fuel pump assembly from the car and installed the Walbro 255lph fuel pump. I’m currently in the process of installing the SARD jet pump killer and -6AN return fuel line, but I need to order another fitting to connect everything and drop it back in the tank. Once the braided lines have been run to and from the engine bay to the tank, I can begin to piece together my fuel pressure regulator setup. 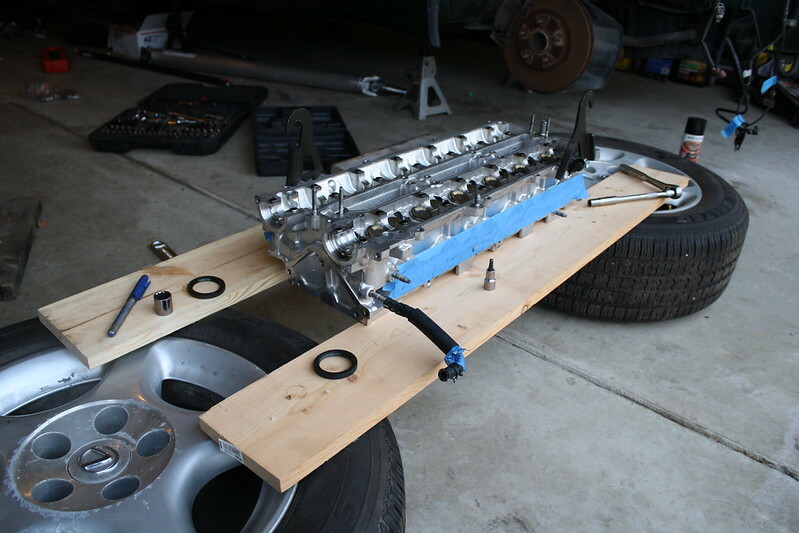 Most of that work won’t actually go down until the engine and trans are situated in the bay though. 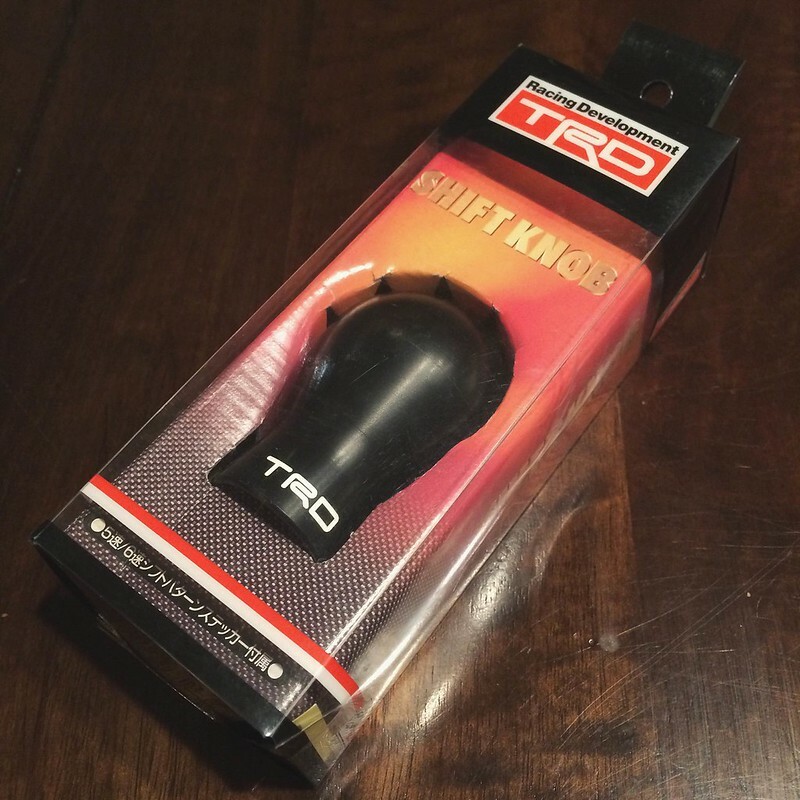 When I had my six speed Toyota Matrix, I bought this genuine TRD duracon shift knob from Japan. After I sold the car, I sold the shift knob to my friend Peter of Modified fame since I no longer had a use for it. 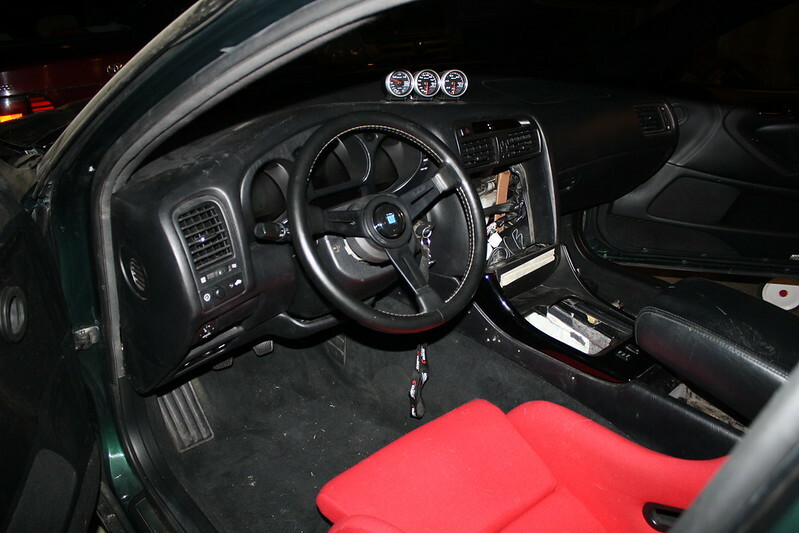 Of course, by the time I started this project the shift knob was nowhere to be found online. Fortunately, Peter is a really cool guy and I was able to convince him to sell it back to me. Really excited to have this piece back! I might need to hit up Broadfield to come up with a solution for my shifter trim and shift boot for me once the transmission is in the car. 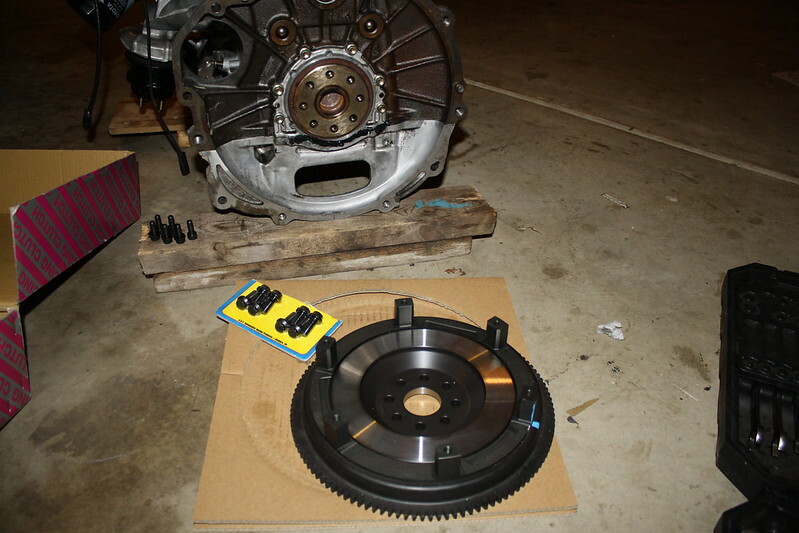 With some more interior stuff sorted, it was time to get back to the engine and transmission. 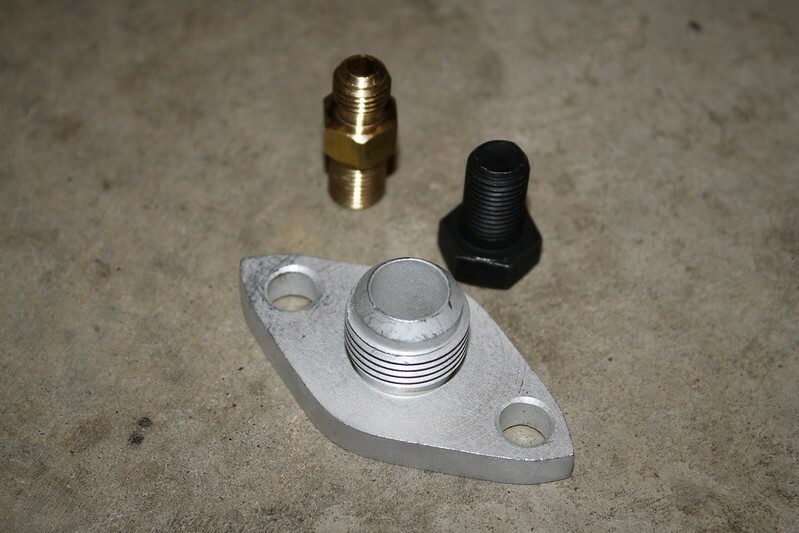 I confirmed that the oil feed and drain line that came with my turbo were going to work with my engine, so I ordered a drain fitting for the block to allow me to connect the -10AN drain line for the turbo. 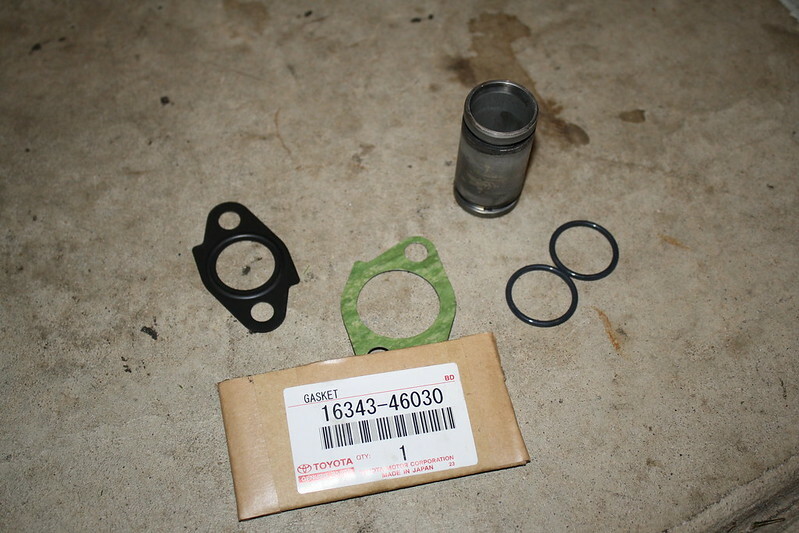 The kit also included a -4AN fitting to attach the oil feed to the block and a block off bolt for the other oil supply hole in the block that is no longer needed with the single turbo setup. 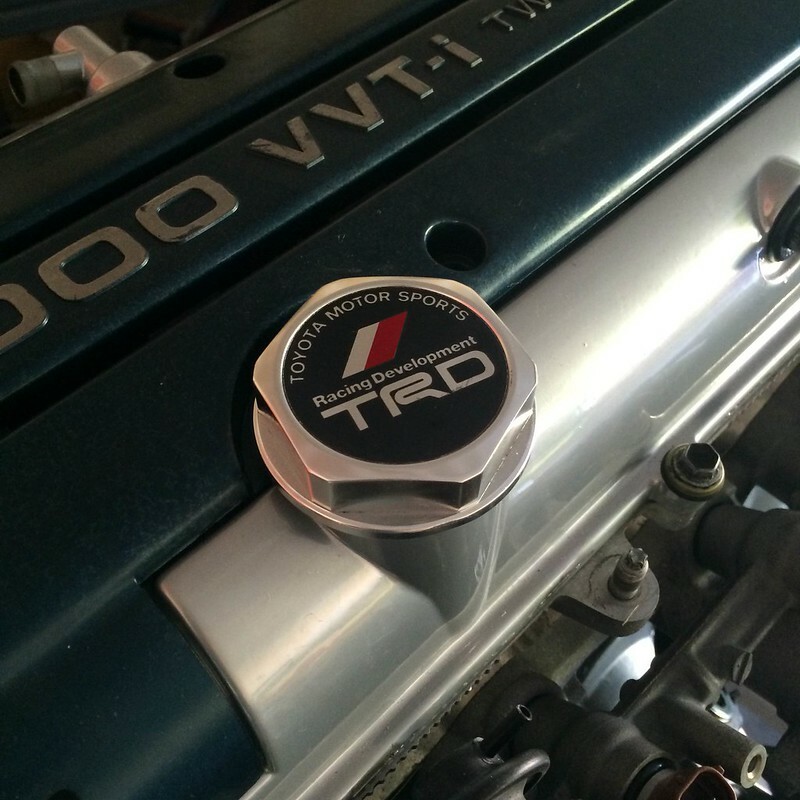 The addition of those items essentially takes care of the oil side of things, topped off by the TRD oil cap I picked up from the Supra forums. My factory oil cap had a crack in it, which was a great excuse to add something that looked a lot cooler. The next thing I needed to address was the coolant system. I picked up some replacement gaskets for the water neck and coolant crossover pipe, so I went ahead and installed those items. 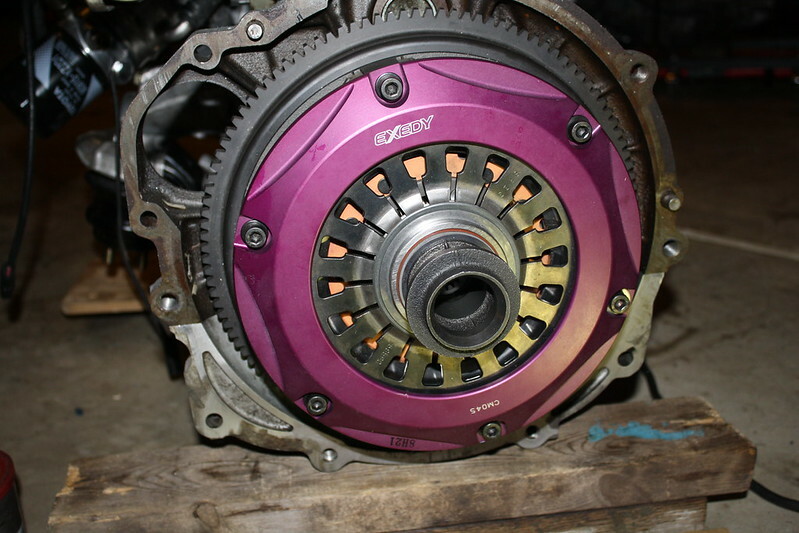 Since my turbocharger is a journal bearing unit, it is not water cooled. This leaves me with about four or five open water ports that I no longer have a use for. It would probably be best to weld these shut, but I opted to install rubber caps with hose clamps since some of the ports are on the water pump and I did not want to go through removing it to have them welded. Some will surely scoff at this, but it will get the job done. All of the ports have been capped off except for the water neck, so I’ll either need to have mine welded up or purchase one from Supra Store to take care of those in the near future. I still need to source a radiator and hoses, as well as hoses for the heater core and then everything coolant wise should be complete, aside from the addition of a water temp gauge at some point down the road. 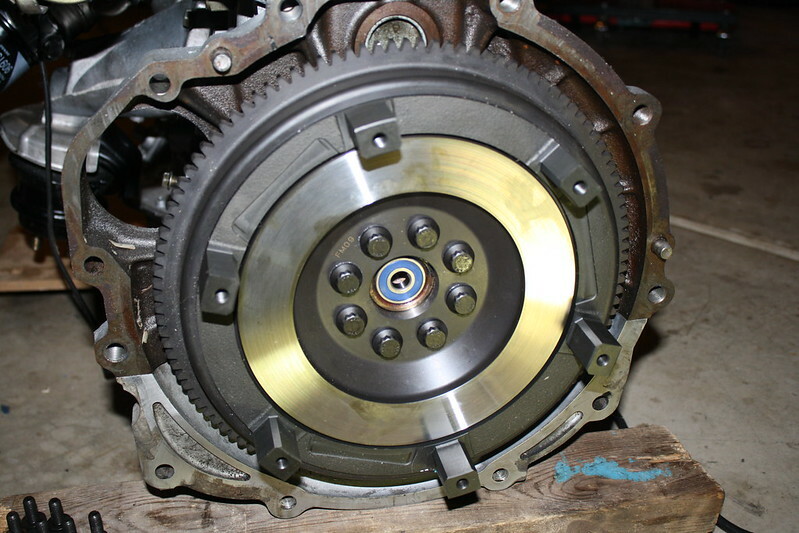 After messing with those items for a while, I decided to install my Exedy twin disc clutch along with a new OEM pilot bearing and ARP flywheel bolts. I’m ready to mate the transmission to the engine at this point, but I’m having a heck of a time getting the trans into position by myself. I’ll have to keep messing with it, and if I can’t get it alone I’ll have to bribe my cousin to come over again and help me out. 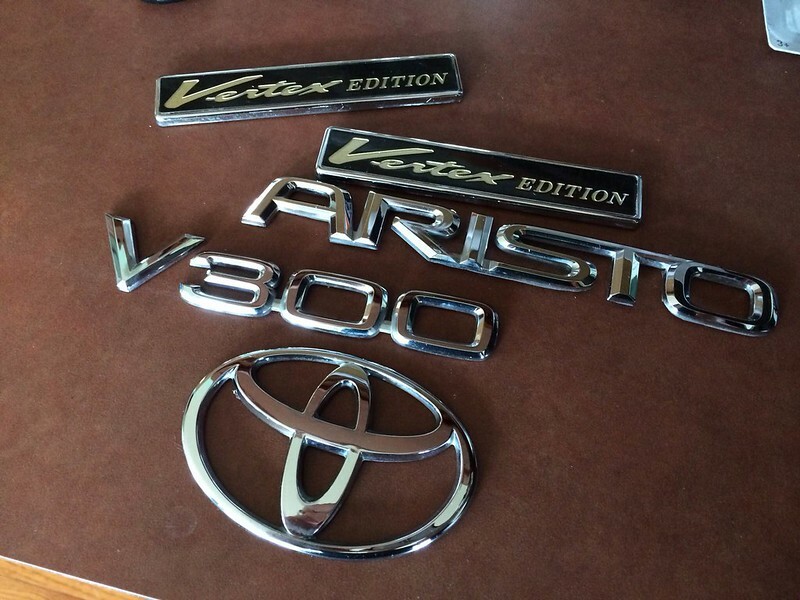 As for parts showing up, I’ve had some pretty cool things arrive lately. 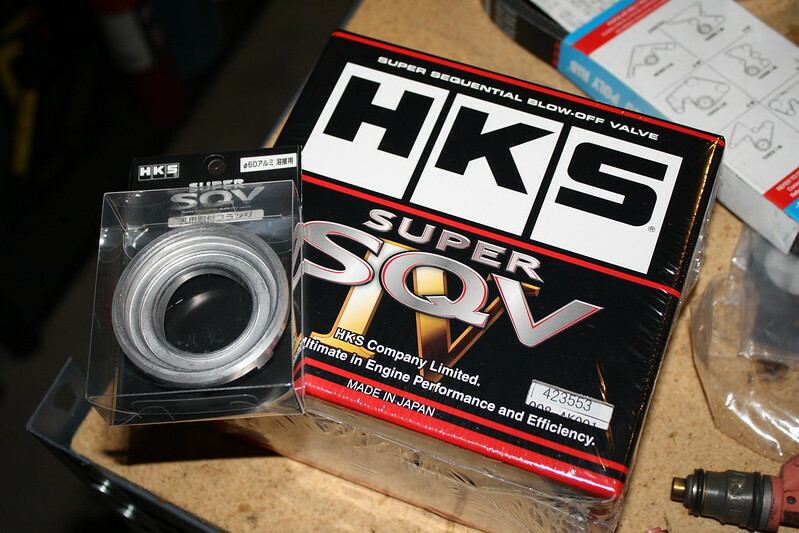 Motivicity Distribution (AKA HKS USA) hooked me up with an SSQV IV blow off valve and flange for the build. Huge thanks to them for helping me out! 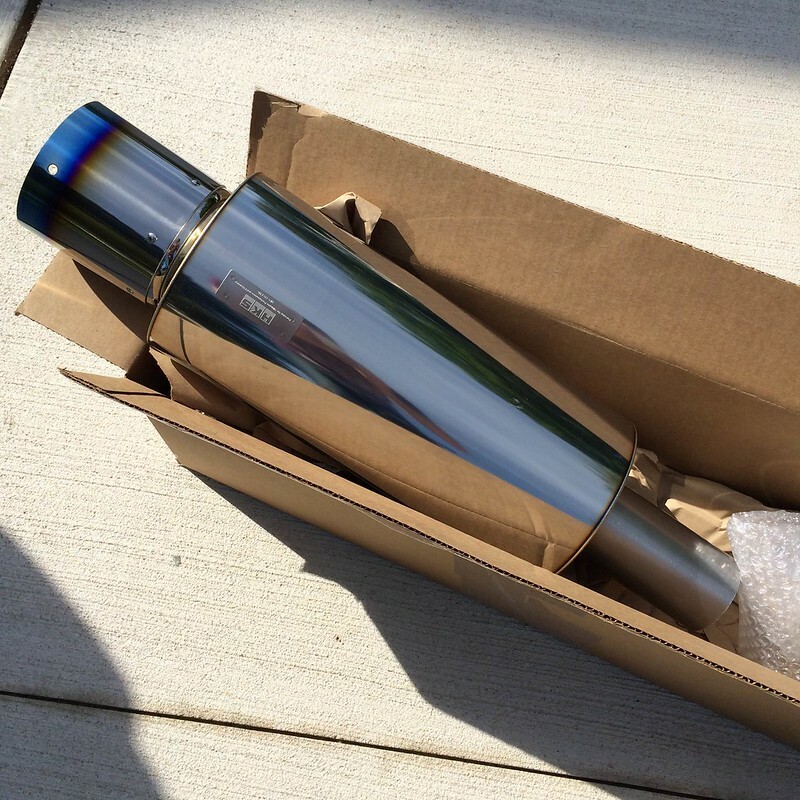 In addition to the blow off valve, I also picked up an HKS Hi Power muffler with titanium tip. All of the aftermarket exhaust systems for this car utilize dual mufflers and I’m not really crazy about the look. I noticed that Orido and NOB both use custom single-muffler setups on their cars, so I decided to follow in their footsteps and do the same. I’ll have my friend Mike fabricate a turboback system with this muffler when the time comes- probably some time this winter. 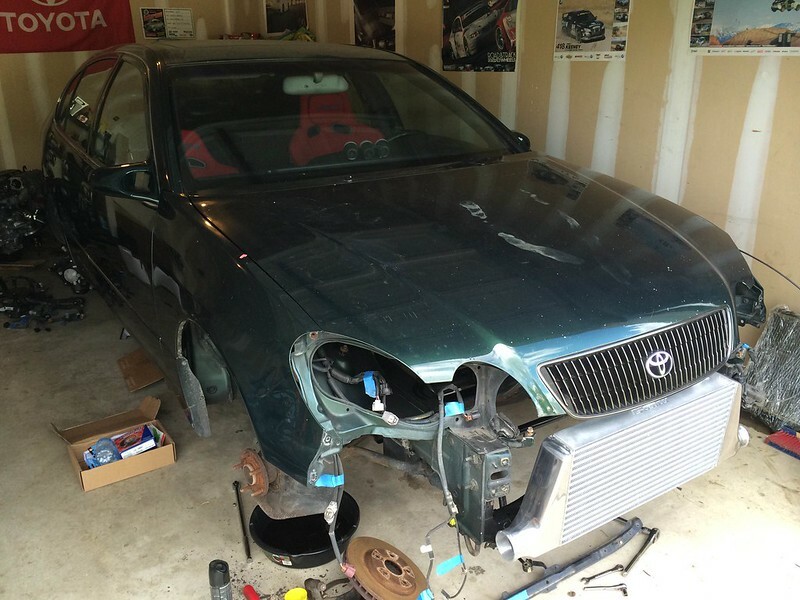 After nearly six months of waiting, my TRUST/GReddy intercooler kit for the Aristo finally arrived at Evasive Motorsports in the states. I’m really happy with the looks of the kit. 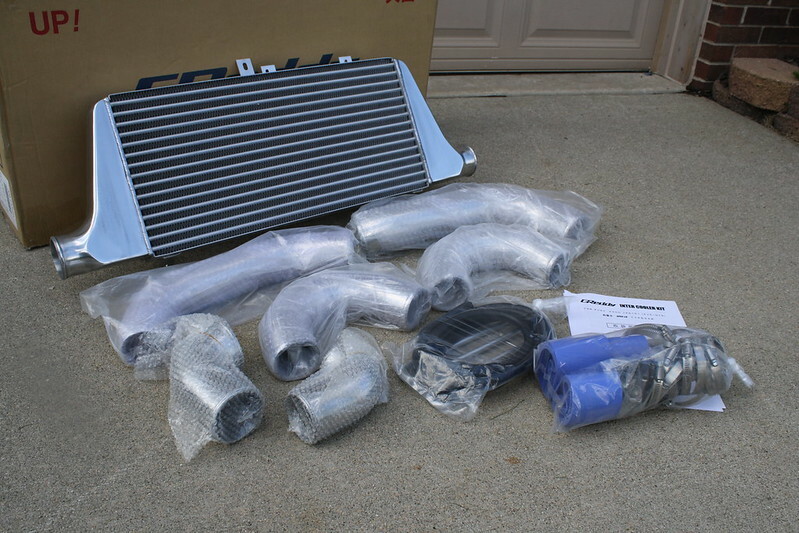 I was also able to source the original GReddy T78 piping to utilize this intercooler kit with the single turbo setup, so that should arrive sometime late this week. 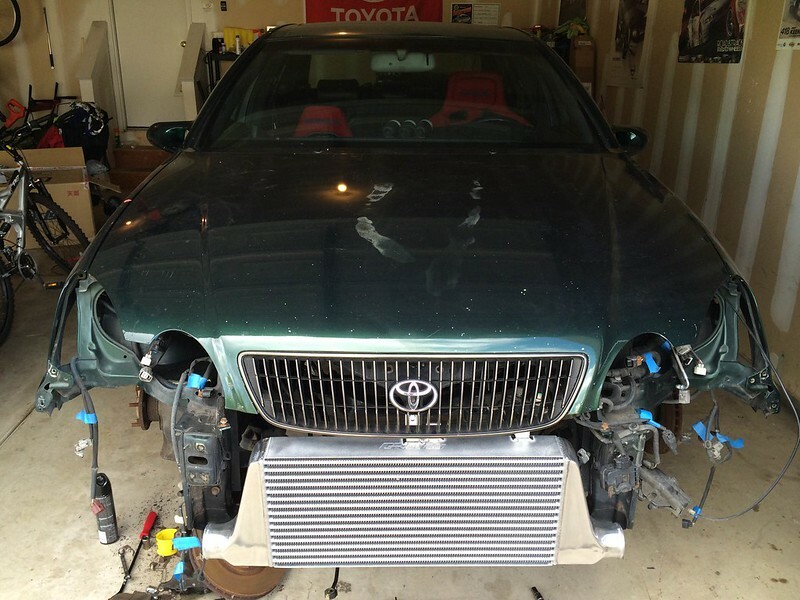 My hope is to source the remaining supporting items to complete my piecemeal GReddy turbo kit in the coming weeks. At this point I mainly need the turbo manifold and intake pipe to complete the setup, but I would love to find a downpipe as well. Even if it doesn’t fit perfectly, it will be a good starting point for a custom setup. 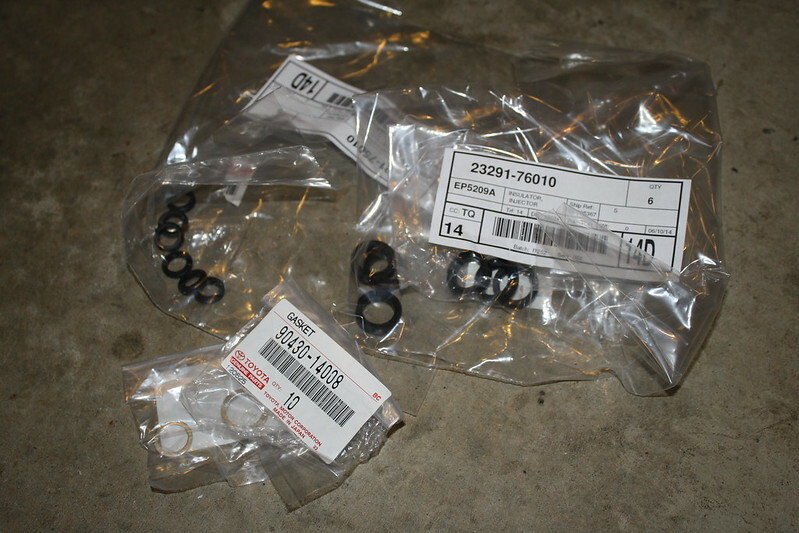 I was able to find most of the gaskets I need for the kit, with the last one on its way to my house right now. Wow, that was a massively long update with what I feel like was a small amount of progress. There’s so much research that goes along with every step of a build like this, so it sometimes feels like I have gotten a lot less work done than I thought I did. But with a long term project that’s just the way things go! 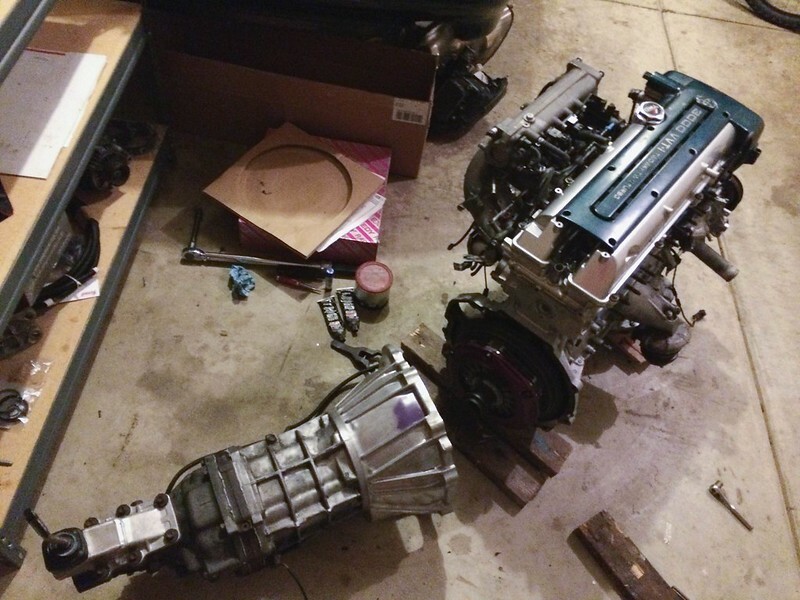 Hopefully by the next update I’ll have the transmission bolted up, the intake manifold and turbo installed, and the drivetrain bolted into the car. Fingers crossed! Thanks a lot for reading and following along. Keep an eye on Speed Academy for more detailed tech and swap info on this project over the coming months! what are you thinking for wheels?!!!!!!!!!! !